it was never going to be about drinking’s ‘effect’. So I started – like I always start – by looking for the beauty. On the table in front of me, an antique blown-crystal cognac glass. I took the cognac bottle and poured. Beside the eddying liquid’s stunning refraction, I was captivated by its amazing cascade. Created by a simple pour, it moved completely unlike water: it had its own special magic. A swirl that took in and gave out light. Intensely magnetic, up this super-close. This magical macro moment would need to be extra-enlarged for the entrance hall of KaDeWe. 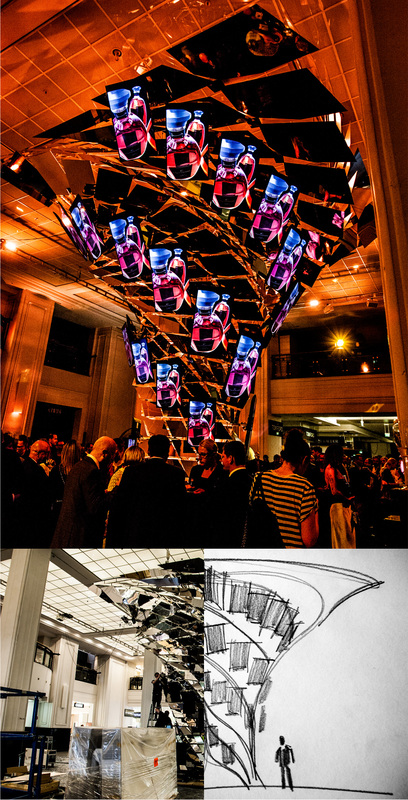 I sketched the idea: a floor-to-ceiling construction of solid spirals, reflecting mirrors and vertical screens. I wanted to create an object which would reflect its own surroundings. The luxury shop-within-a-shop. The people walking by. The Hennessey brand itself. I wanted to make it feel as if it would be part of the KaDeWe forever. Not an alien object. Something taking up the architecture, and projecting Hennessey into the future. And we posted endless selfies to social media, just to prove the point.